Just ask Mylen Fe Yamamoto. When we interviewed her a year ago, her Kickstarter for her new invention, Cropsticks, was just 24 percent funded. 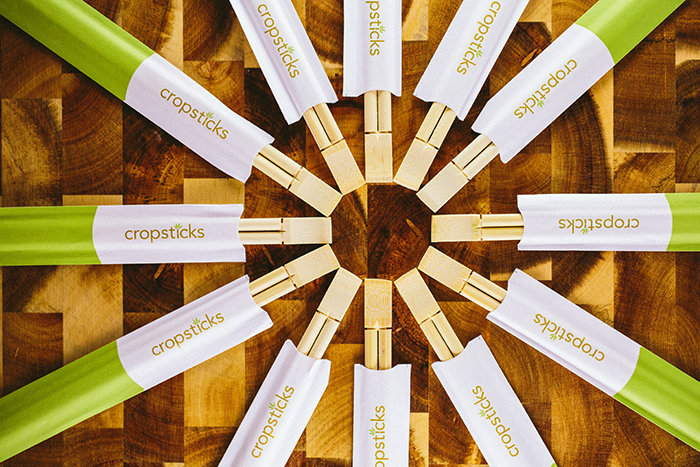 Cropsticks took the viral hack of snapping off the top of your disposable chopsticks to make a holder and built it into a patented, environmentally friendly product. 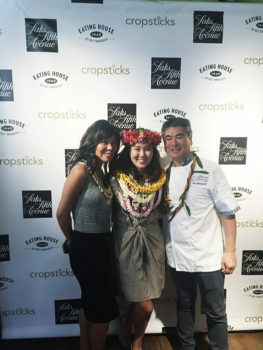 In the last 13 months, this Moanalua High School graduate got funded by Kickstarter, left her full-time job as a university instructor, made repeated trips to China to perfect her product, opened an office in Playa Vista, Calif., and just celebrated the official launch of Cropsticks in Hawaii at Roy’s Restaurants and MW. Oh, and did I mention she got married too? Shelley Tadaki Cramer of Saks Fifth Avenue, Mylen Fe Yamamoto and Roy Yamaguchi. In our last interview, when I asked your top local restaurants where you’d love to see Cropsticks, your first answer was Roy’s. A few weeks ago, you announced Cropsticks will be in all 10 Roy’s Hawaii restaurants. How does that make you feel? Happy that folks now have a place to enjoy Cropsticks alongside some of the best food that Hawaii has to offer. How did you approach Roy and how did you make the deal? I’ve always been a fan of Chef Roy and how he’s represented Hawaii and its food to the rest of the world. A colleague introduced us and I was so fortunate that he shared the same enthusiasm for Cropsticks and supported our passion. Where else has your Cropsticks adventure taken you in the last 13 months? Cropsticks got accepted to the XLR8UH venture accelerator in Hawaii and that was super helpful as we had pitch practice every week through the program. And most recently, we attended CES in Vegas where we got invited to pitch Cropsticks on HSN. I met casting directors for Shark Tank at the Inc GrowCo conference last May. That was definitely a good conference. For someone who doesn’t know “Shark Tank,” explain the TV show to them. Budding entrepreneurs get the chance to bring their dreams to fruition. They present their ideas to the Shark investors in the tank, who are multimillionaires and billionaires. Entrepreneurs try to convince any one of the Sharks to invest money in their idea. Out of all reality TV programs, I think this is as real as it gets. What was it like auditioning for Shark Tank? It’s a long process and there are many steps. There were about 40,000 folks who auditioned in previous years so it’s quite competitive, which means you can’t half-do any step. What was it like during filming? Everyone’s really nice. Production was very organized and my favorite part was that they played music before the pitch to hype everyone up. Which Shark were you most intimidated by before filming? Which Shark surprised you most? What’s one big lesson you learned from your Shark Tank experience? To be less afraid. Before the Tank, I really cared a lot about what people were thinking about me and my business. After pitching a room of millionaires and billionaires and surviving, I feel more confident that Cropsticks is capable. What’s one tip for pitching to investors? Never disrespect money but also know it’s a two-sided relationship you’re building. Mutual respect should be the foundation of your pitch. And raise before you desperately need the money. During all this, you managed to get married. How did you fit the biggest day of your life into this crazy year? I have a great team at Cropsticks who I trust to get things done. And personally, my husband Ron is the most calm and level-headed person I know. I’m lucky to surround myself with good people. 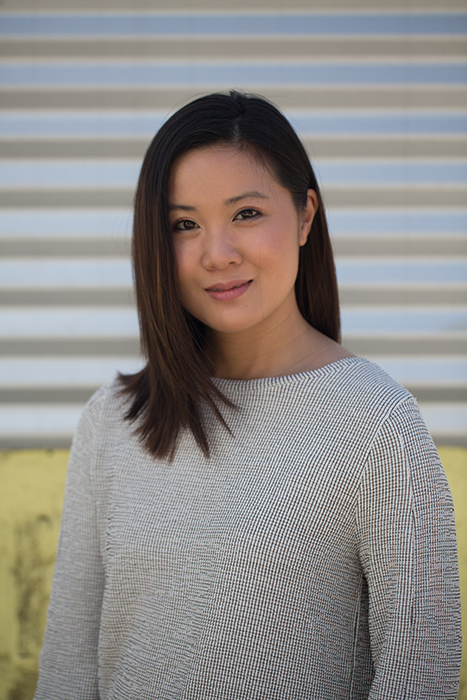 In addition to my husband, we have J. Garrett Karr, Chul Lee and Jay Chang on the Cropsticks team. We keep each other sane. What was the best piece of advice you learned this year? “Aligning your mission with your business is the most important. The money you spend on aligning the two is the best investment you can make.” – Blake Mycoskie, Founder of TOMS Shoes. You used to teach entrepreneurship at Loyola Marymount University. What’s the biggest lesson you’d share with your students from your experiences this year? Be kind to yourself and good to others. And have a side hustle. Always. Where do you see Cropsticks a year from now? The dream is to have Cropsticks all over the world while living out our core mission to be a green and sustainable business that does good with the next generation in mind. Did Mylen get a deal? 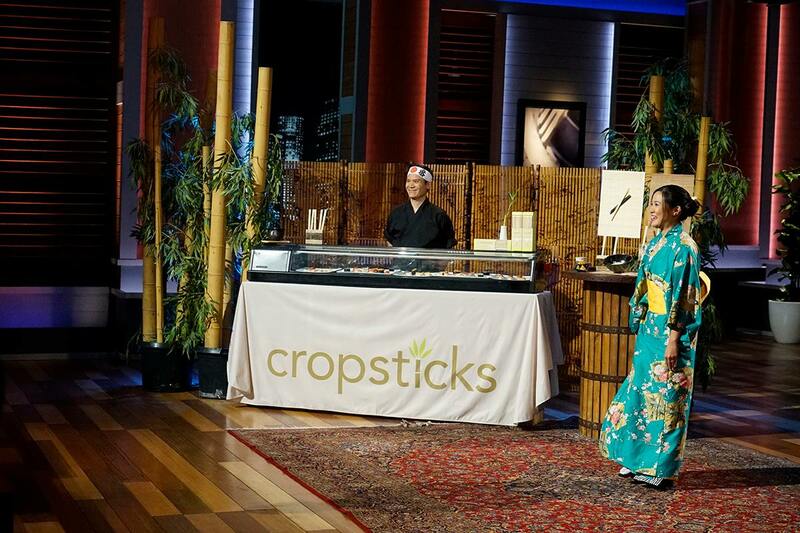 Watch her pitch Cropsticks on ABC’s “Shark Tank,” Friday, April 7th at 8 pm HST. Learn more about Cropsticks at cropsticks.co.